NB! WinterKleen Covers are manufactured to overlap the pool 20cm on each side. Daisy WinterKleen uses a fine polypropylene mesh that is strong enough to survive the elements but lightweight for easy handling. The finished cover is taut across the entire pool overlapping it by 200mm with tie-down toggles, about 800mm apart, anchored a further 200mm from the cover edge. That means that you need of 400mm from your pools edge to install a WinterKleen. The tie-down toggels are easily oulled tight one by one until taut. Leaves and dirt taht fall on the cover can be blown or swept off the cover. A WinterKleen comes in Blue or Green and comes as square cut to fit over any shaped pool. 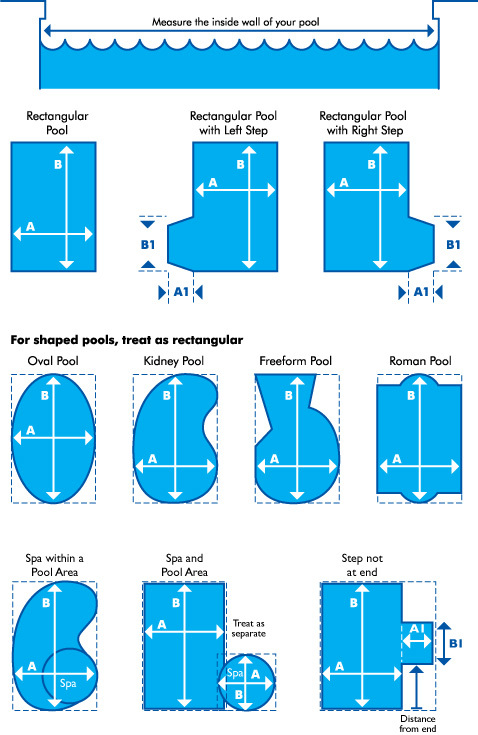 With extra measurements, a cover can be shaped to the pool. A WinterKleen comes with an 8 year pro-rata warranty and is easily removed when it's time for a swim. WinterKleen Mesh Pool Cover from Daisy for Winter months to keep leaves and debris out of the Pool. 8 Year Pro Rata Warranty. How to install Daisy WinterKleen Pool Cover? Chalk mark and number a series of l points 200mm out from pool edge 1, 2, 3 etc. starting clockwise from A all around to l B about 900mm apart. Closer on tighter curves further apart for straighter edges. Draw a sketch of the pool outline indicating approximate location of points A and B and the points between. Email to us your measurements in the table below. The same method and measurements will be used to make the cover. NOTE: This measuring procedure applies only to curvilinear pools. If you measure counter clockwise from ‘A’ the cover will be manufactured upside down. Estimated delivery time from the time of completed payment is 10 business days. Please contact for more info.